There is a high likelihood that South Korea will be Cambodia’s third strategic partner, after China and Japan. Chheang Vannarith tells why. The first state visit of South Korean President Moon Jae-in to Cambodia last week marked a new milestone in advancing the bilateral relationship, as evidenced by deep political trust and concrete cooperation. Both countries are working towards a more comprehensive cooperation. It was rare, or perhaps it was the first time, that prime minister Hun Sen hosted private dinner for Moon and his spouse on the first day of the state visit. Normally, the King hosts welcome dinner for foreign leaders on an official visit. It was a special diplomatic gesture by the Cambodian host indeed. No one really knew what the two leaders discussed at the dinner table with a family-type atmosphere. Some have guessed that the two leaders were talking about exploring the opportunities to upgrade their bilateral ties to a comprehensive strategic partnership, similar to the one that Cambodia currently has with China and Japan. Moreover, the body language between the two leaders was very positive, reflecting sincerity and friendship between the two leaders. While formality matters in diplomatic protocol, informality counts more in terms of trust building and friendship cultivation. It seems that Hun Sen did win the heart of Moon. 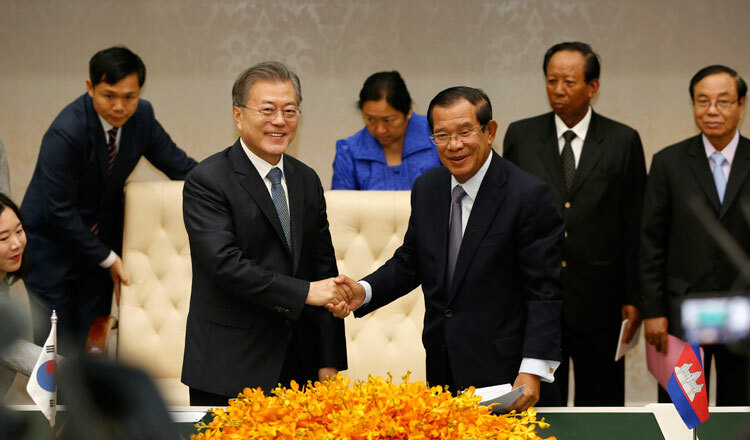 Hun Sen wrote on his social media page that, “the state visit of Moon Jae-in, President of South Korea, to Cambodia this time has contributed to the advancement of friendship and comprehensive and broad cooperation between the two countries”. Before leaving Cambodia, Moon wrote on his social media page that, “standing before Angkor Wat, my respect for the Cambodian people has deepened further still. Angkor Wat is Cambodia’s past and, at the same time, its future. I am convinced that the Miracle of the Mekong River will certainly come true”. “I am profoundly grateful to King Norodom Sihamoni and prime minister Hun Sen for extending heartfelt hospitality and allowing to witness Khmer civilisation,” he added. In terms of concrete cooperation, five agreements were signed including an agreement on a soft loan of $700 million for 2019-2023 period. Cambodia is the second largest development partner of South Korea. From 1996 to 2018, Cambodia has received $632 million financial aid in which $300 million was in the form of grants. Future key areas of development cooperation relate to water treatment, energy sector, human resource development, public health, and rural development. South Korea is Cambodia’s second largest investor, after China, with the accumulated investment capital of about $5 billion from 1994 to 2018. Both sides will soon conclude a double taxation avoidance agreement to facilitate more investment flows. At the Cambodia-Korea Business Forum, Hun Sen encouraged South Korean investors to explore more investment opportunities. “I would like to call on the private sectors and Korean investors who have not come to Cambodia to learn about the potential and investment opportunities in Cambodia and to invest in Cambodia to contribute to the development of the country. We will take full advantage of all these achievements,” he said. Hun Sen also pledged that he will lay out sharp measures to increase Cambodia’s competitiveness, improve and enhance the investment and business environment, and diversify the national economy and create more quality jobs for Cambodian workers. Some new areas that South Korea should invest are clean energy, digital economy, agro-industry, light manufacturing industry especially to supply parts and components to main South Korean factories located in Vietnam, and the hospitality industry.